The Cloud ID reduces the number of steps required to start sending data from Beats or Logstash to your hosted Elasticsearch cluster on Elasticsearch Service. Because we made it easier to send data, you can start exploring visualizations in Kibana on Elasticsearch Service that much more quickly. The Cloud ID works by assigning a unique ID to your hosted Elasticsearch cluster on Elasticsearch Service. All deployments that support the Cloud ID automatically get one. Deployments running version 5.x and later are all supported, including ones that existed before we introduced the Cloud ID. You include your Cloud ID along with your Elasticsearch Service user credentials (defined in cloud.auth) when you run Beats or Logstash locally, and then let Elasticsearch Service handle all of the remaining connection details to send the data to your hosted cluster on Elasticsearch Service safely and securely. Beats is our open source platform for single-purpose data shippers. The purpose of Beats is to help you gather data from different sources and to centralize the data by shipping it to Elasticsearch. Beats install as lightweight agents and ship data from hundreds or thousands of machines to your hosted Elasticsearch cluster on Elasticsearch Service. If you want more processing muscle, Beats can also ship to Logstash for transformation and parsing before the data gets stored in Elasticsearch. Logstash is an open source, server-side data processing pipeline that ingests data from a multitude of sources simultaneously, transforms it, and then sends it to your favorite place where you stash things, here your hosted Elasticsearch cluster on Elasticsearch Service. Logstash supports a variety of inputs that pull in events from a multitude of common sources — logs, metrics, web applications, data stores, and various AWS services — all in continuous, streaming fashion. The following example shows how you can send operational data from Metricbeat to Elasticsearch Service by using the Cloud ID. Any of the available Beats will work, but we had to pick one for this example. Set up the Beat of your choice, such as Metricbeat version 6.7.1. 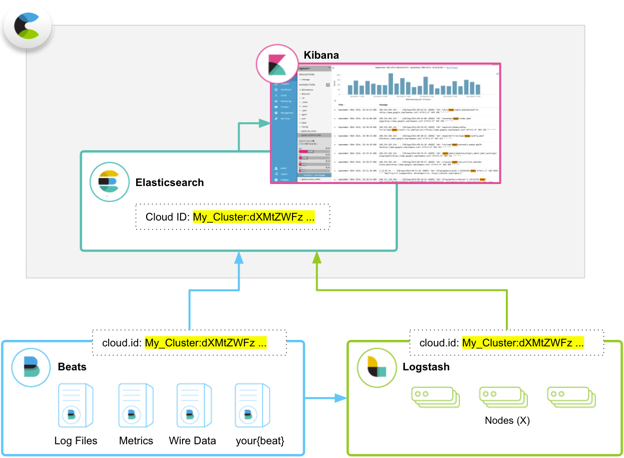 The following example shows how you can send operational data with the Cloud ID from Logstash to an Elasticsearch cluster hosted on Elasticsearch Service. Download and unpack Logstash version 6.7.1. Modify the logstash.yml configuration file for Elasticsearch Service to add your user name and password.